During the complimentary Hotel Investor's Marketplace Webcast scheduled for November 9, HBI president Joe McCann will be joined by lodging industry media... And, instead of posing the questions, these Editors will be answering them. Lodging industry Editors spend every day focused on the facts of the industry, participating in industry investment conferences, interviewing experts in the industry and studying industry analyses. They are familiar with all aspects of the industry. 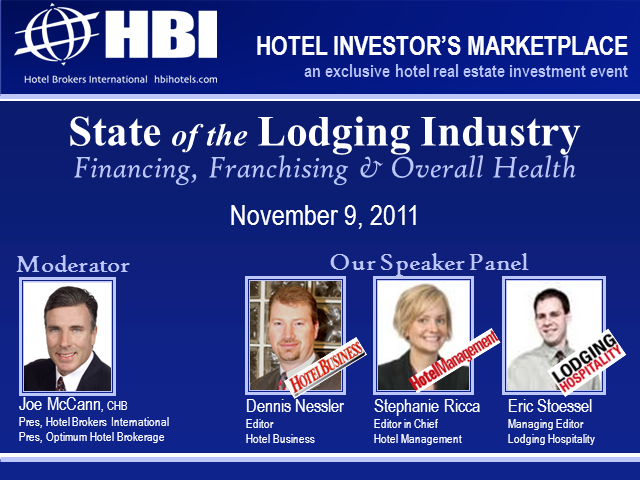 Through this Webcast industry Editors will share their perception on the State of the Lodging Industry. Webcast attendees will glean invaluable information on a variety of hospitality industry topics including: finance, hotel franchise and the overall health of the industry.